Samuel Thomas CRABTREE was born 30 Dec. 1838 at 28 Mile Bluff, AL. He died 17 June 1923 at about 85 and is buried at Indian Springs Cemetery at Eight Mile, AL, where his tombstone reads that he was born 1838 and died in 1923. Amie Akerman notes that both Phelan B. Crabtree, son of Sam Sr., gave Samuel T. as being born in 1838. 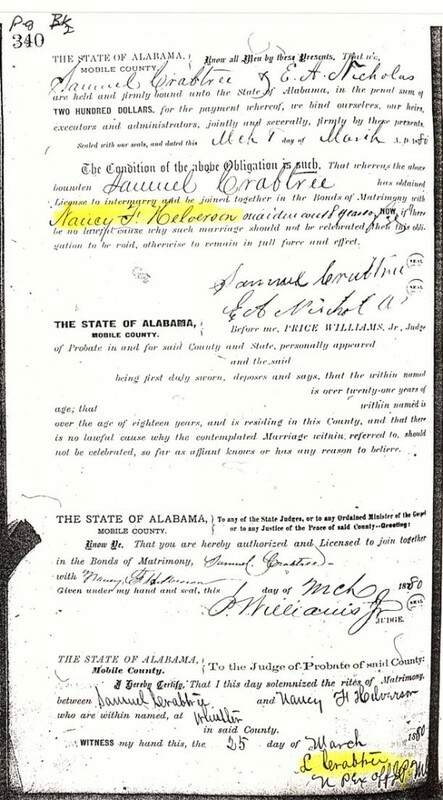 On 10 March 1859, at Mobile, AL., Samuel, 21, married Margaret OVERSTREET, daughter of Jacob OVERSTREET and Elizabeth DAVIS. Margaret (perhaps Margaret Mary) was born 14 March 1840 in GA and died 1872 at 32. She is buried at Indian Springs Cem., at Eight Mile, AL. “John Overstreet son of Henry, father of Jacob is on Page 2, #4. John’s son James is on Page #13. b.15 Feb 1807 d.18 Mar 1883. Jacob is on Page 5 #14 b. 1810 d 1845. “Jacob and his family are listed in the 1849 Wayne Co, Ms census with Elizabeth and his children. Jefferson b. 1832, Sarah b.1835, Ferba b. 1837, *Margaret (my ggrandmother) b. 1839, Brazil b. 6 Aug 1842, and Rosier R. b.1844. “Samuel Thomas CRABTREE b.12/30/1838 d. 6/17/1923 Birthplace 28 Mile Bluff, AL. Buried Indian Springs Cem. Eight Mile AL. Son of Ervin and Sarah Ann Faggard CRABTREE. Samuel m. Wife #1 unknown. (7) Thomas Jefferson b. 7/1/1870 d.5/18/1918. Marguerite died 1872. Thomas was two yrs old. (8) Eliza Ann b.1876 d.1924 WHO WAS ELIZA’S MOTHER? She would have to be Wife #3. (10) Virginia Belle b. d.
(11) Ruth Erette b. d.
(12) Rosa Lee b.7/17/1890 d.
(15) Sarah Ann (Sally) b.8/9/1902 d.
“I Was told by Uncle Phelan, Aunt Sarah Beatrice PARNELL and Rena Crabtree BOOTHE (the ggGranddaughter of Theodore) that Amos was the son of Nancy HEVELSTON. He was either adopted by Samuel Sr. or just took the name of CRABTREE. His last name was FOSTER. There is more to this story, told me by Uncle Phelan. There was a murder committed in Mobile Co. area, and shortly after that, Theodore and Amos left the area and, in his words, ‘high tailed it to the Richburg and Hattisburg, MS area’. Theodore was married to an Indian woman (unknown to me). They did meet two sisters Catherine and Hattie HARTFIELD and married them. Theodore married Catherine and Amos married Hattie. They are all buried in Richburg Cem. I met Amos’ children on a visit to Hattisburg in 1984. FamilySearch, Internet Genealogy Service, in an August 21, 1999 site search gives Samuel “Sam” as being born 1850 in Georgia and that there were these other siblings to Samuel Thomas and Adam Bell, but the dates are very far off from what Amie Akerman sites: iii. Littleton “Lit” born 1848, Gainsville, Hall Co. AL. Married Nancy. iv. Jacob “Jake” born 1852, GA. Married Jane Miller, born 1852. The 1860 census shows Samuel CRABTREE living in the same area as the KEARNS. Irvin CRABTREE, his brother, was father of Adam Bell CRABTREE, father of Susie CRABTREE who married Rhett Goode KEARNS. Death certificate of son Thomas Jefferson gives Samuel’s birth place as AL, Mobile Co. Following are Samuel’s marriage licenses to Margaret Overstreet and Nancy Francis Helveston. Right click on images to view larger.